Cleopatra’s Needle Forest Reserve one of the oldest and most diverse forests in the Philippines and home to countless endemic species has gotten additional protection following its declaration as a critical habitat. The Palawan Council for Sustainable Development, a multi-sectoral and intergovernmental body, approved a resolution designating Mt Cleopatra’s Needle as such. This act is known as the Wildlife Resources Conservation and Protection Act, defines a critical habitat as a portion of land outside a protected area that is characterized by the presence of threatened species, considering its endemicity and richness in the area as well as the presence of threats to its survival. The 38,693-hectare Cleopatra’s Needle Forest Reserve is part of the Cleopatra’s Needle Mountain, the city’s highest peak with an altitude of 1,593 meters. This 40,000-hectare mountain lies on the northern part of Puerto Princesa, near the world-renowned Puerto Princesa Subterranean River National Park. 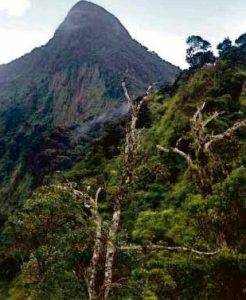 The Centre for Sustainability, a Palawan-based nongovernmental organization which initiated efforts to secure the designation, said the Cleopatra’s Needle Forest Reserve is part of pristine forest neighboring the Underground River that remains unprotected. This area is a real biological gem! It is the last safe haven for countless endemic species, and it functions as an important corridor for species crossing the island. The area serves furthermore as the largest watershed in the city and provides water for approximately 30% of its residents. Thought to have gone extinct a long time ago, two endemic species of amphibians – the Palawan toadlet (Pelophryne albotaeniata) and the Malatgan River caecilian (Ichthyophis weberi) – were rediscovered just last year in Mt Cleopatra’s Needle. In 2014, a rare ant species, Romblonella coryae, named in honor of former president Corazon Aquino, was also found in the mountain’s primary lowland forest. Other endemic species that take refuge in its intact forest include the Palawan hornbill (Anthracoceros marchei), Palawan peacock-pheasant (Polyplectron napoleonis), Palawan flycatcher (Ficedula platenae), Palawan bearcat (Arctictis binturong), Palawan bearded pig (Sus barbatus), Palawan flying squirrel (Hylopetes nigripes), Palawan birdwing (Trogonoptera palawanensis), and many more. There are probably others waiting to be discovered and rediscovered. This verdant wildlife haven is also home to Palawan’s slowly disappearing Batak Tribe whose population is only about 200. They share this place with the Tagbanua, another indigenous group in the province.